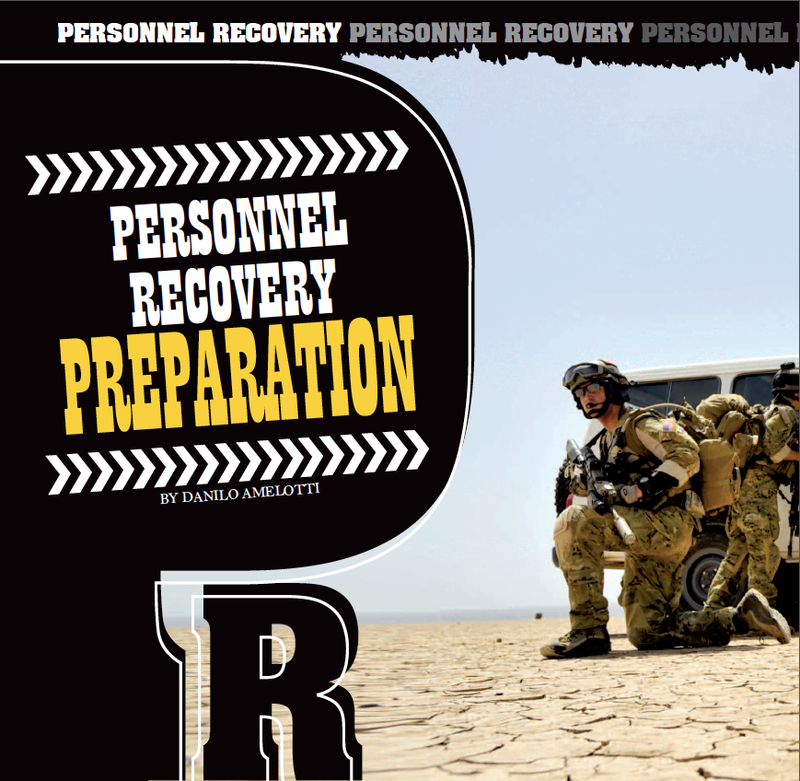 PERSONNEL RECOVERY: Preparation – "Danilo Amelotti"
In this my second analysis dedicated to the PR Operations (Personnel Recovery), I consider important to specify that none of the articles written about it intends to promote a self-styled “Correspondence course”, but on the contrary aimed to let our readers better understand this complex system which expresses an enormous effort both in human power and in means for the recovery, sometimes of “just” one man. For this reason you will not find anything about how the trainings are held, but a general description of the operations and the preparation tended to focus on a better comprehension of the system. That said, and going back to the main theme of this new chapter, today I want to focus our attention on the first of the four pillars of every PR operation: The Preparation. The PR Preparations is divided into two main phases; the first will be focused on study and the subsequent drafting of doctrines and policies, education and a more thorough training of all stakeholders in the PR operations, as well as the development and acquisition of appropriate equipment. The second phase will began right before deployment to any crisis areas, both for individual and UNITs / armed force, which will have the specific aim of prepare all possible actor in PR operations. All modern PR operational doctrines and Policies are resulting from the study carried out by the various experts on the previous operations, therefore applying on the new doctrines all required improvements and changes. Browsing through the various doctrines (SOPs) from World War II to the present day, it is clear which and how many improvements have been made over time. As long as most modern conflicts (such as the Vietnam War, the first Gulf War, the Falklands War, etc..), still had a well defined front line, therefore with a clear enemy to fight (a fight “fairly conventional”), the PR missions were generally carried out in order to recover personnel from Special or similar forces, pilots, and intelligence services (because these were the only ones to operate behind enemy lines and therefore more exposed to risk of capture). With the conflicts’ evolution, and the net change in the type and scope of all missions (in which, generally speaking, NATO nations have been faced), the policies and doctrines of the PR undergone a profound change, going to include in such operations any person, whether military or civilian, considered “isolated element.” Clearly, while the doctrine (almost never definitive), once updated, remains almost the same for all nations that perform PR, policies can change considerably. In fact, while the doctrines or SOP (Standard Operational Procedures) dictate a general guideline on how PR should be organized, managed and executed, each state dictates the course of action to be taken in different cases when we should envisage isolated elements. Although I do not consider appropriate, nor necessary, comment on how different nations choose specific methods of intervention, it seems important to me to emphasize this difference; to better explain this concept is probably enough to say that some governments, when faced with a situations of “isolated elements”, rather prefer to move with the use of diplomacy, while others favor the intervention of the various armed forces. Other examples of why those policies and doctrines have been changed over the years can be easily spotted watching the newspapers released during the past conflicts and those of today. Up to that time was easy to read dozens of ads about prisoners made by regular enemy forces, which belonged always (or almost) to the regular forces of one of the nations involved in the fight; the same prisoners were described as generally (not always) treated according to the parameters laid down in the Geneva Conventions and maintained, until liberation, in so called “prisoners camps”. Obviously, the most percentage of catches, occurred between the rows of Special Forces, or pilots, therefore people operating inside the enemy territory and beyond the front line. On the contrary, in contemporary newspaper is common to find reportage of episodes of seizure of military, but especially civil personal, which are not part of these Elite Forces; today who capture or kidnap are (in most cases) not anymore belonging to regular forces of a particular national army but are rebels, terrorists or guerrillas of various factions, most definitely not signatories to the Geneva Convention, and looking only for a mere hostage in an attempt to have media/political impact that serve the scope to gain money, weapons, or release of “brothers of war. Another example of why policies have undergone such changes stems from disagreements arising from capture by non-belligerent nations, or at least not directly involved in the operational area; i.e. military or civilian personnel who, for various reasons, find themselves in unauthorized place (as happened with the British sailors captured by the Iranians in 2008). Even in these cases, although in a completely different situation from missions or wars, the arrested personnel will be in a condition where an operation of PR (probably conducted mainly at political level) will be needed. From these previous examples, it is then possible to infer and understand the reasons why all the NATO and other countries had to increase-modify and implement the PR doctrines initially created in the past. The education and training of all personnel participating in the PR operations are complex and rich of variables, therefore difficult to exhaustively explained in few words or lines. It is therefore necessary to specify, that also in this case, we have a subdivision of the category “training” in two well defined areas: The first of these areas is formed by all the staff who will be involved in a PR operation for recovery: the elements of the various Command and Control cells (CC), the flight units, the SAR teams (search and rescue) that acts on the ground and so on. These exercises will be however combined in the normal training routine to which the various actors will be involved: for example, flight departments that perform maneuvers for the various missions or assigned tasks, will be able to perform the same infiltration techniques and movement together with a recovery mission. The reason for this last statement seems obvious; the PR operations, in many aspects, are not very different from any other military operation, moreover, as mentioned in the first chapter (Issue #6), there are not UNITs or department dedicated solely to PR (USA excluded of course), but each person or structure used in a mission theater can/will become the main actor of these operations whenever his/her participation will be required. A fundamental part of this phase will be the study of policies and doctrines, so that all staff will always be able to immediately operate within PR operation, therefore, without having to spend time in understanding of methodology and procedures when a PR operation will be “on course”. The second area of training is dedicated to all those who run the risk of becoming “isolated elements”. Even in this case, a good part of the lessons is included in the normal training routine of a soldier. Clearly, at this stage the major role is attributed to the now famous and abused SERE training and concept (Survive Evade Resist Escape), and to the understanding of the national policies and doctrines in use. That way, as it is often misunderstood, this part seems simple enough, but in reality is very complex and has (sometimes) deficiencies at various levels. 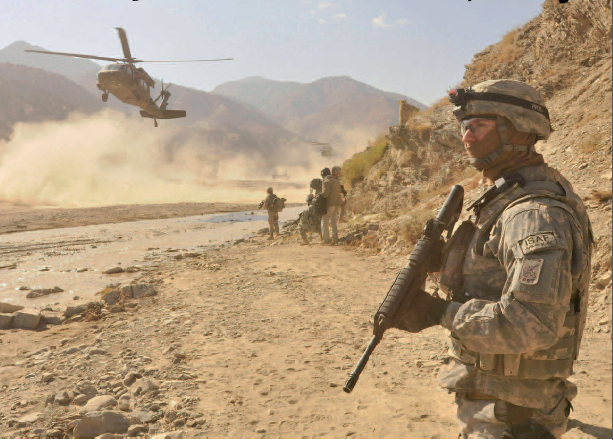 To easily understand it is necessary to specify that if a SERE course requires only 3-5 weeks, the staff participant must already have specific knowledge that some times do not belong to the normal training routine of all soldiers or civilians (i.e. ability to navigate with the use of large-scale maps, ability to determine a viable landing area for helicopters etc..). In addition to this factor, it should also be considered that prepare all members of the armed forces, even if for a course of three weeks only (partly because of the complexity of the course itself), it is an effort that both in economic terms, and in time it is not affordable by any nation. The organization of these preparatory cycles, in fact, requires an enormous effort, a consistent number of instructors and a high financial commitment. For this reason, in the most recent doctrines, these courses have been divided into three instructional levels, going to inform and educate personnel on the basis of the task assigned and the real risk of being in critical situations. In instance, it will be necessary to inoculate a full path (i.e. 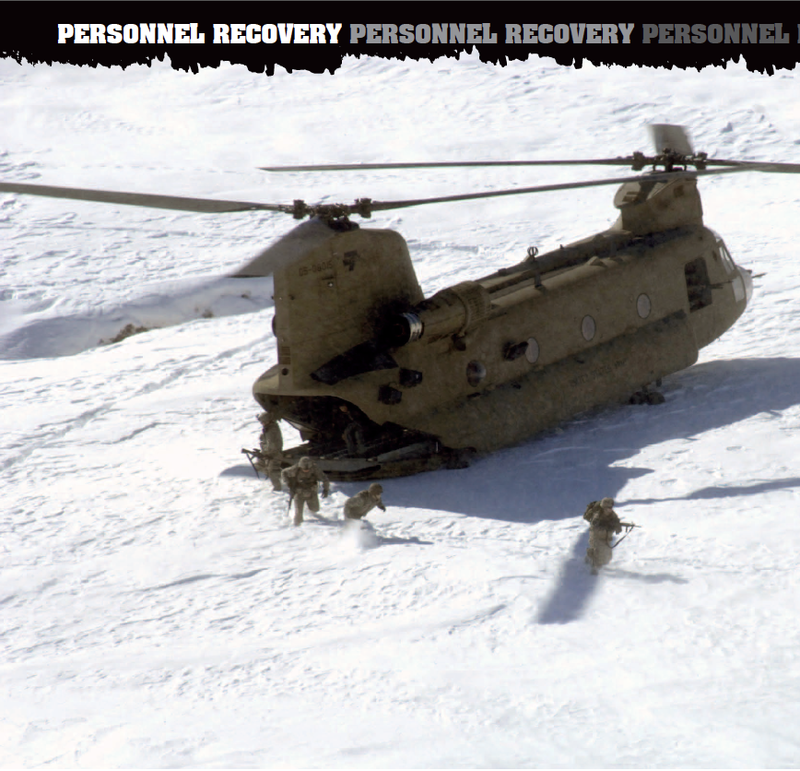 top-level) to all the personnel who will materially participate in recovery operations (and therefore a high risk of finding themselves in a situation of “isolated element”), while all the personnel that will maintain a low risk position (office, no missions etc. ), we’ll limit the teaching to a lower level (but not less important). Another problem of this training phase is represented by the coordination between the various elements participating in a PR operation. As mentioned in the first chapter (TNM #6), the JOINT structure, both to a national and multinational level, is a “must” of these missions. It is in fact evident that, however a mission will be well organized and coordinated, it is not always possible to put together all the constituent parts for the operations, especially when it comes to multinational structures. In this case, in fact, it often happens that the staff will be found to work with other international forces only in the moment in which a real PR operation is launched (or other kind of operations). It is for this reason that the production of standardized training and doctrines not only nationally, but also in NATO environment is becoming of paramount importance. Only the full application of a doctrine common to all actors can ensure that the operations carried out in PR JOINT multinational structure, can have a high rate of success. Another aspect that is of great importance in the preparation and study of all PR operations is the equipment. It is certainly easy to infer the reasons, in fact, if we look at the five key moments of a recovery operation, we could not avoid to notice that some equipment are critical to its success. If you can affirm that there is no PR operation without an isolated element, then it is equally likely possible to affirm that there won’t be an isolated element if no one will be informed! Based on this simple equation is the study and development of equipment needed. The better, easy to use and secure the equipment will be, the more chances to successfully execute a recovery of “isolated element” will be high. Also in this case, a starring role in the evolution of the equipment has been the evolution of the conflict and operating theaters, but especially the technological development. Thanks to these two factors, the equipment supplied to the personnel employed in the “hostile” territory, have gradually improved both in quality, and in its accessibility ‘; they are, indeed, not only assigned to small groups of highly qualified personnel (such as pilots or secret agents), but are now available and distributed to most of the personnel employed on the ground. As it happened for most of the preparation steps, the equipment today in use for PR operations is the same as for other types of operations. Looking at what was in the backpack of the SAS team that went in Iraq in the first Gulf War, and analyzing the today equipment used by a normal soldier, we will note, in fact, that not only is the same that at that time had only FS, but it is also and greatly improved both the quality and the functions. In instance, while in the 90s when the GPS (Global Position System) was a utopia even for the pilots (in the 90s pilots flying airplane not properly new often use to navigated with GPS purchased on the market), today almost all the soldiers have such instrument, t hat are also able to promptly communicate their position independently (thus without the need to perform any radio communication). I do not know if this technology was initially developed for the needs of PR, or whether it evolved to classical operational situations. What is certain, is that with the project “the future Soldier” that all nations are developing, is to be expected that soon every single man on the ground, will be equipped with equipment and instrumentation able to keep him/her in constant contact with the base, thus instantly communicate location, conditions and any other relevant information to the performance of the operations and the survival of the soldier him/herself. In this section we enter the second phase of preparation, in other words, the whole set of studies preparations and training necessary before entry into operational theater or in high-risk areas. This phase will always start with a deep study of the employment areas’, going to focus specifically on the geopolitical situation in the territory of interest (in order to better define how many and what kind of threats and risks can be present), the climate, terrain, etc.. Also at this time policies and doctrines will cover an important role: unlike the first phase of preparation, however, these will no longer suffer any substantial modification, but just slight variations such as to adapt the procedures at the specific area of interest. In example, , during “Enduring Freedom” in Afghanistan, some Black Hawk pilots claimed to have considerable difficulties performing tactical landings in desert places; due to the turbulence created by the rotor and the consequent lifting of sand in the air, The pilots did no longer had the ability to estimate the distance from the ground, resulting in an impediment to the safely land. Therefore, in order to improve the conditions, they implemented a variation to the SOPs of all flight operation, preferring the flight without doors; these modifications where of course including the PR missions. These kinds of Changes on the PR SOPs are normally not implemented on a large scale, but only if that change becomes really necessary. During this second phase, will be also revised the trainings, going to step (where possible) all those training specifically targeted to the PR operations, and covering specific elements typical of areas of interest. Will be also introduced, specific lessons and trainings on the environment in which personnel will have to operate, like in instance, basic and advanced concepts of movement and survival in the desert areas, jungle or whatever they will be. Finally, there will be a case study and procurement of specific materials and equipments, this also according to the economical situation and technological innovations of the moment.